This is good news. Hopefully they don't cancel it. I'm actually serious. Please don't cancel this. Wow, I remember that old scanlation site. It wasn't perfect (a tiny bit of the spelling and grammar was off), but it was the only way for us to enjoy the X1 manga without the language barrier. It's certainly a much better job than the person who tried to "translate" the X2 and X3 manga (and did an incredibly horrible job of it, as well as adding their own stupid little mini-comics at the end about how bad they were at doing it while using official Mega Man X art to show X and Zero getting mad at them). I knew there was a chance of the novel being based on the manga. 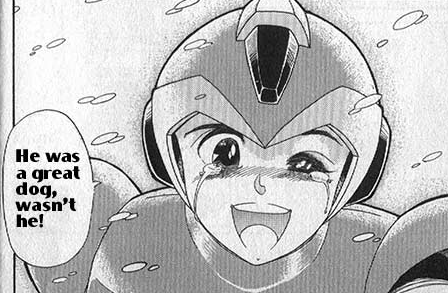 first with the manga's artist set to draw it, then the cover showing X with a tear. i'd give it a try if there's a scanlation. wonder if they plan to make novel for X2 and 3 (since there have been manga for theses two game as well), i guess it'll depend of the sales. There was also a manga for X4 (though no one attempted to translate that one at all) as well as a Chinese manhua for X5 (though that one was completely zany at times and did its own thing, like X punching out a human thug for his stupidity). Gah, Dr. Neko's Lab--a shame they never finished translating X1 at the very least. Still a little bitter that UDON never brought this one over.